This article is about the philosophical concept. For the 2014 book by Rajiv Malhotra, see Indra's Net (book). For the geometry book, see Indra's Pearls (book). The metaphor's earliest known reference is found in the Atharva Veda. It was developed by the Mahayana school in the 3rd century Avatamsaka Sutra and later by the Huayan school between the 6th and 8th centuries. "Indra's net" is an infinitely large net of cords owned by the Vedic deva Indra, which hangs over his palace on Mount Meru, the axis mundi of Buddhist and Hindu cosmology. In this metaphor, Indra's net has a multifaceted jewel at each vertex, and each jewel is reflected in all of the other jewels. Far away in the heavenly abode of the great god Indra, there is a wonderful net which has been hung by some cunning artificer in such a manner that it stretches out infinitely in all directions. In accordance with the extravagant tastes of deities, the artificer has hung a single glittering jewel in each "eye" of the net, and since the net itself is infinite in dimension, the jewels are infinite in number. There hang the jewels, glittering "like" stars in the first magnitude, a wonderful sight to behold. If we now arbitrarily select one of these jewels for inspection and look closely at it, we will discover that in its polished surface there are reflected all the other jewels in the net, infinite in number. Not only that, but each of the jewels reflected in this one jewel is also reflecting all the other jewels, so that there is an infinite reflecting process occurring. And the atoms in these lands are even harder to tell of. They [Buddhas] know all phenomena come from interdependent origination. different phenomena in all worlds, interrelated in Indra's net. The manner in which all dharmas interpenetrate is like an imperial net of celestial jewels extending in all directions infinitely, without limit. … As for the imperial net of heavenly jewels, it is known as Indra’s Net, a net which is made entirely of jewels. Because of the clarity of the jewels, they are all reflected in and enter into each other, ad infinitum. Within each jewel, simultaneously, is reflected the whole net. Ultimately, nothing comes or goes. If we now turn to the southwest, we can pick one particular jewel and examine it closely. This individual jewel can immediately reflect the image of every other jewel. As is the case with this jewel, this is furthermore the case with all the rest of the jewels–each and every jewel simultaneously and immediately reflects each and every other jewel, ad infinitum. The image of each of these limitless jewels is within one jewel, appearing brilliantly. None of the other jewels interfere with this. When one sits within one jewel, one is simultaneously sitting in all the infinite jewels in all ten directions. How is this so? Because within each jewel are present all jewels. If all jewels are present within each jewel, it is also the case that if you sit in one jewel you sit in all jewels at the same time. The inverse is also understood in the same way. Just as one goes into one jewel and thus enters every other jewel while never leaving this one jewel, so too one enters any jewel while never leaving this particular jewel. In each of the lion's eyes, in its ears, limbs, and so forth, down to each and every single hair, there is a golden lion. All the lions embraced by each and every hair simultaneously and instantaneously enter into one single hair. Thus, in each and every hair there are an infinite number of lions... The progression is infinite, like the jewels of Celestial Lord Indra's Net: a realm-embracing-realm ad infinitum is thus established, and is called the realm of Indra's Net. Vast indeed is the tactical net of great Indra, mighty of action and tempestuous of great speed. By that net, O Indra, pounce upon all the enemies so that none of the enemies may escape the arrest and punishment. This great world is the power net of mighty Indra, greater than the great. By that Indra-net of boundless reach, I hold all those enemies with the dark cover of vision, mind and senses. This world was the net of the great Sakra (Indra), of mighty size; by means of this net of Indra I envelop all those people with darkness. ...was characterized there as the antariksa-, the intermediate space between heaven and earth, while the directions of the sky were the net's sticks (dandah) by means of which it was fastened to the earth. With this net Indra conquered all his enemies. In Gödel, Escher, Bach (1979), Douglas Hofstadter uses Indra's net as a metaphor for the complex interconnected networks formed by relationships between objects in a system—including social networks, the interactions of particles, and the "symbols" that stand for ideas in a brain or intelligent computer. Buddhism uses a similar image to describe the interconnectedness of all phenomena. It is called Indra's Net. 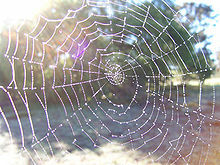 When Indra fashioned the world, he made it as a web, and at every knot in the web is tied a pearl. Everything that exists, or has ever existed, every idea that can be thought about, every datum that is true—every dharma, in the language of Indian philosophy—is a pearl in Indra's net. Not only is every pearl tied to every other pearl by virtue of the web on which they hang, but on the surface of every pearl is reflected every other jewel on the net. Everything that exists in Indra's web implies all else that exists. to help understand the multiplicity of causes and effects producing the way we are and the way we were [...] In the same way, the journeys through Brook's picture-portals intersect with each other, at the same time shedding light on each other. the profound cosmology and outlook that permeates Hinduism. Indra's Net symbolizes the universe as a web of connections and interdependences [...] I seek to revive it as the foundation for Vedic cosmology and show how it went on to become the central principle of Buddhism, and from there spread into mainstream Western discourse across several disciplines. ^ "Alan Watts Podcast – Following the Middle Way #3". alanwattspodcast.com (Podcast). 31 August 2008. ^ a b Jones 2003, p. 16. ^ Lee 2005, p. 473. ^ a b Kabat-Zinn 2000, p. 225. ^ Cleary. The Flower Ornament Scripture A Translation of the Avatamsaka Sutra, 1993, page 925. ^ & Cook 1977, p. 2. ^ Odin 1982, p. 16-17. ^ a b Odin 1982, p. 17. ^ Malhotra 2014, p. 4-5, 210. ^ Ram 2013, p. 910. ^ Ram 2013, p. 910-911. ^ Beer 2003, p. 154. ^ a b Goudriaan 1978, p. 211. ^ a b c d Goudriaan 1978, p. 214. ^ Brook, Timothy (2009). Vermeer's Hat: The Seventeenth Century and the Dawn of the Global World. London: Profile Books. p. 22. ISBN 1847652549. Retrieved 26 November 2012. ^ Burton, Sarah (2 August 2008). "The Net Result". The Spectator. Retrieved 1 March 2010. ^ Malhotra 2014, p. 4. Cleary, Thomas (1983), Entry Into the Inconceivable: An Introduction to Hua-yen Buddhism, University of Hawaii Press, ISBN 978-0-8248-1697-1 . This page was last edited on 13 April 2019, at 23:52 (UTC).